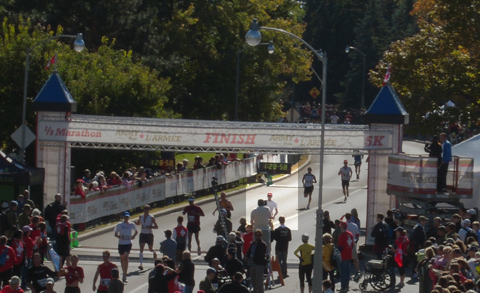 This being only the second annual Army Run, the race was still small in comparison with the Ottawa Race Weekend. There were just under half the number of participants at a total of 4270 runners which made it much more enjoyable for me. Don’t get me wrong: it’s awesome to see and be with all those runners but bigger crowds pose more logistical challenges than smaller ones. This race was special, being a way for Canadian civilians to support their troops and for the troops to say “thanks” for the support. A cannon was fired instead of the usual blow horn for the start of the race, a group of injured soldiers (one single-leg amputee hoping to break a 1:20:00 record, one double-leg amputee and others in race wheelchairs) participated, military bands were playing at various locations throughout the course and a group of soldiers were just beyond the finish line handing-out the dog tag-style finisher medals. Pretty cool! 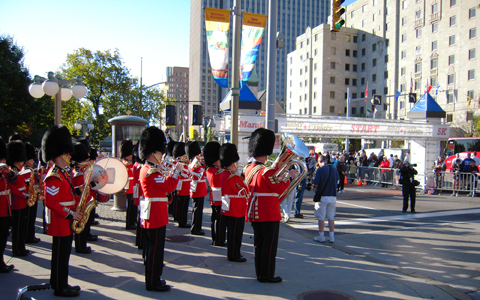 A military band at the start line. 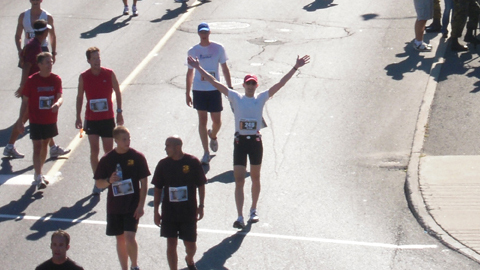 My sprint to the finish line — you can see I’m just about to cross over and the official time clock reads 1:28:58.
wow! That’s a great personal best and you must be very happy with your performance in this marathon.